Songs about love, space, & symmetry. My new albums are available now! You can download them both for free on Bandcamp. Symmetric Geometry/Geometric Symmetry is a joint release with two separate albums, each with 10 tracks. All of the tracks on Symmetric Geometry feature vocals, while Geometric Symmetry is entirely instrumental. After 5 long years, a project I began with Tyler Ringer & Jeremy Ray has finally been released. Recording began on May 2nd, 2010, and was completed on August 21st, 2011. In the subsequent 4 years, I spent time on and off re-programming instruments, mixing, and mastering. These are by far the largest songs I’ve worked on, with some songs containing as many as 94 tracks. Attempting to mix such massive songs was a bit daunting, but I’m happy with how they turned out and am excited for them to finally be released. They all feature a wide variety of unique instruments, some you’ve maybe never even heard of before! You can read the full credits list on Bandcamp. You can download the 32-minute album for free — just click Buy Now on Bandcamp and enter 0 in the Name Your Price box. The album features 7 songs, all coming together to form a story, while each song seamlessly transitions from one track to the next as the journey continues. I’d recommend downloading in one of the higher quality formats, such as ALAC, to make sure the gap timing is preserved, as MP3 can add space between songs as a byproduct of its compression process. Each track also has its own artwork, each a scene from the Tapisserie de l’Apocalypse. I hope you enjoy these songs as much as we did making them! 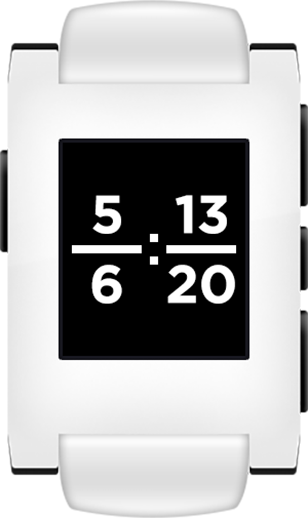 Fraction Clock is now available for Pebble! Tell time in reduced fractions. But what if you took that to the next level? “What time is it?”, they ask? Fraction clock takes the current number of hours and minutes over the total number of hours and minutes and reduces them to their lowest form. It provides an interesting new way to tell time, allowing you to easily see what fraction of the hour or day has gone by. Use 24 or 12 as your hour divisor. Using 24 tells you how far you are past midnight. Using 12 tells you how far you are past midnight in the AM and how far you are past noon in the PM. Part 3 of the pens, pencils, and notebooks collection. Rotring 800+ Mechanical Pencil + Stylus Hybrid 0.5mm – Like the 600, but with a tip that doubles as a tablet stylus. Tombow Mono Zero Eraser 2.5mm x 5mm – Skinny when it needs to be, but can cover more area with the wider side. Uni Jetstream Alpha Gel Ballpoint Pen 0.7mm – The best ballpoint with an alpha gel grip, what more could you ask for? Pilot Hi-Tec-C Gel Ink Pen 0.4mm – Great writing gel pen! Pentel Graph Gear 1000 Drafting Pencil 0.4mm – Love the 0.4mm lead option, and the retractable tip is great. Pilot FriXion Ball Slim Gel Ink Pen 0.38mm (Red) – Beth brought these back from Japan during her semester at sea trip. It’s a pen that you can erase! Zebra Expandz Ballpoint Pen 0.7mm (White) – Love this guy, usually what I carry on me; nice and compact. Zebra SL-F1 Mini Ballpoint Pen 0.7mm (Gray) – A little smaller than the Expandz, can take a Fisher universal refill. Fisher Space Pen Bullet Ballpoint Pen – A classic. Midori MD Notebook – A very nice notebook, another thing Beth brought back from Japan. and on the bottom right is a Boogie Board – a cool digital tablet that you can use a stylus to write on and push a button to erase. Here are a couple of pictures of my Buckyballs collection. It’s old news by now, but it’s a shame they got discontinued. There is a recall issued for them, but I have no intentions of returning them; I’ll do what I can to resist the urge to swallow them. There’s an interesting article on the rise and fall of Buckyballs here. If you’d like, you can still buy Bucky Bigs and Buckyballs encased in lucite here. I just recently got a new camera, the Canon SL1, and I love it! I would highly recommend it to anyone as an entry-level DSLR. It’s a great camera that is easy to use and takes beautiful images. I had the chance to take lots of pictures during my summer in Seattle so I figured I would share them, you can few the whole set on my Flickr page here. I’ve been loving my new messenger bag, the Timbuk2 Proof, but what’s great is that it doubles as a camera bag with the Snoop. When I’m using my bag for work or school and don’t need all my camera gear, I can just slide the insert out and keep everything safely stored inside its padded compartments. Anyways, I hope you enjoyed the pictures! If you’d like to see more, you can always follow me on Flickr, Lytro, or Instagram. My first computer build, dubbed “The Modest Beast”, has served me well. Now its successor, “The Promiscuous Beast”, has risen to life! After many BSODs, I’ve finally reached a stable overclock of 4.5GHz, up from the 3.5GHz stock speed. I probably could have reached 4.6GHz, but it would have required upping the voltage to 1.3, which was giving me temperatures around 90° Celsius under load, which I wasn’t crazy about. Under my current configuration, I’m getting temperatures under 80° Celsius while running AIDA64, and around 25° Celsius idle. I’ve read that with Haswell, it’s pretty much luck of the draw, and while my chip isn’t the greatest overclocker, I’m happy with the results.